Notes help you keep track of what you need to do about a form entry. When you access an entry on FormSmarts, notes are listed alongside the information submitted. Notes are especially useful for accounts with multiple users. 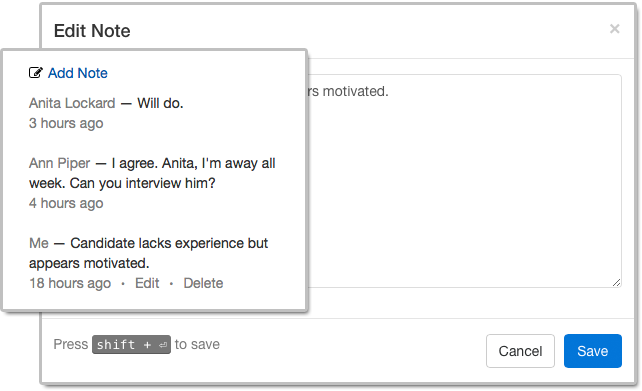 A note is associated with the person who posted it and all users can see all notes, so notes allow a conversation between users centered around the form entry. Who Can Benefit from Notes? Support a discussion between users about a form entry. Even when form responses usually don’t need to be reviewed individually like with registration forms, notes can help document exceptions and incidents like “Chargeback after credit card was stolen. Paid by bank transfer.” or “Attendee changed to Jeanette Bowman”. Scan the QR code from a confirmation email or PDF receipt provided by a customer. All users, both the account owner and invited users in the same account can add notes. If a forms was set up to send submissions to more than one person, a separate user should be created for each receiver so they can log in to FormSmarts and post comments. Invited users who were given access to individual entries pertaining to a given form can add notes and edit their own notes (and delete them provided they have write permission). Notes have keyboard shortcuts: Create a note with Alt + C, save it in the editor with Shift + Enter. If an entry is deleted, all notes associated with it are also removed. Posted on Nov 1st, 2018 in collaboration. If you use online forms for lead generation, you will want to know the source of form submissions: from which page of your site a form was submitted, which social network or site the visitor came from, or which marketing campaign led the prospect to you. You can track the source of leads received via form submissions with the fs_ctxval context parameter, giving it a unique value for each source or campaign you wish to track. In this article, we show you how. If you need help setting this up, let us know. As you would expect, context values are collected by FormSmarts and shown in notification emails, online & PDF reports, exports to Excel and web API callbacks. If you manually inserted the code snippet for the same form into multiple pages of you site, follow instructions in this section to track leads. If you added the form to your site template, skip to the next section (for WordPress sites) or the one after (for other template-based sites). Alternatively, grab a fresh copy of the code snippet from the form builder, edit the code as described, then add it to your site in the usual way. If you added a form to the template of your WordPress site, you can track the URL of the page a form was submitted from with PHP. 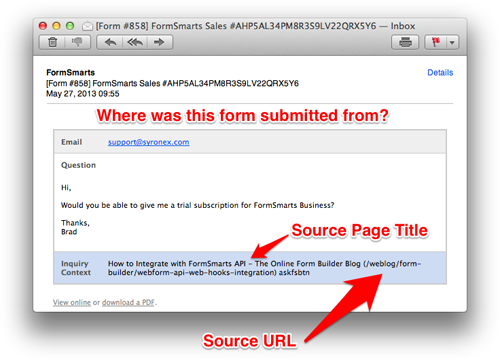 Paste the form’s code snipped given by the form builder between the single quotes as shown. This feature is included with all Business plans. Context data may not contains non-alphanumeric characters other than “()*/:-.? ” and may not exceed 150 characters. Posted on May 27th, 2013 in form builder. Anyone using a standard text field for dates should upgrade to the new date type. Fields with the date type show as a text box, with a datepicker poping up when the field is selected. A datepicker allows users to input dates in an intuitive and interactive way, therefore reducing the risk of errors. Another reason for using a datepicker is to alleviate the date format problem. Because of date formatting differences, 12/07/2008 means December 7th in the U.S., but July 12th in Europe. Although we initially thought of adopting the ISO/W3C date format “yyyy-mm-dd”, we eventually preferred the U.S. format “mm/dd/yyyy”. That is, until we release an internationalized version of FormSmarts. Because users don’t interact directly with the text field (unless they want to), but rather with the datepicker, they don’t have to be aware of date formatting issues. To avoid any misunderstandings, dates are displayed as Sunday July 20, 2008. Any questions or comments? Leave a reply. We are in particular interested in feedback from non U.S. users. 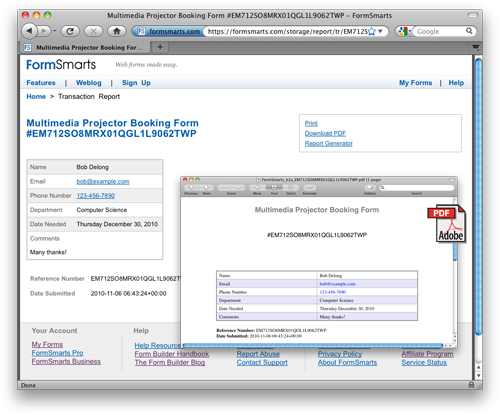 Posted on Jul 20th, 2008 in form handler. We’ll be upgrading at the end of the week some key components of FormSmarts. The changes will affect both form users and form owners. Posted on Apr 15th, 2008 in form handler.